Welcome Aboard! Don’t get comfortable. If you spend any time in South Jersey, you know that “the ferry” is the Cape May-Lewes Ferry. Every day of the year, a fleet of enormous boats ferry cars, campers, motorcycles, bikes, people and pets 17 miles across the Delaware Bay from Cape May, New Jersey to Lewes, Delaware. But just once a year, a ferry carries a few thousand crazy people off shore so they can jump off a perfectly good boat, only to swim back to shore. This year, nearly 2,000 participants joined me in jumping from a ferry that was not on fire. Then we all swam back to shore, rode our bikes for a little bit, then ran along the Delaware Bay. The weather was beautiful, a little windy and a little warm, but the humidity was low and the sky was blue. I arrived to the race site as the sun rose with my WBTU teammate, the Mini Race Director, an ETC first timer. (The Race Director chose to torture herself at Eagleman this year.) We met up with the lovely Jordan Hedding as we worked our way onto the ferry. That’s us right there. Well, that’s our butts at least. It was a party on the boat, complete with DJ Delmo spinning all your favorite tunes. All right stop. Collaborate and listen. The WBTU team all found each other on the boat: Mrs. Donovan, the Rev, Mini RD, and the Jelly Bean. FOTTs Vaughn B and Timmy Mac are standing in the background, looking left out and lonely, as they should, because they are boys, not girls, and girls rule. Photobombed by several strangers, and by a struggling Ian Michael, who was in an epic battle with his wetsuit. The International distance triathletes exited the boat first. Their swim was about a mile. It’s always fun to watch. It is more fun than it looks. And I think it looks like a blast. Then it was the sprinters’ turn. That’s me with Jelly Bean, waiting for an open spot. Once we found one, she pushed me really hard and said, “GET THE HELL OFF MY BOAT,” which I thought was a little over the top. Meanwhile, FOTT and provider of awesome Salming running shoes Tommy D. is giving a pep talk to a fellow jumper. He said, “Don’t jump from that side of the boat. The blonde will push you off and scream at you.” True story. You know what happens next. I swam back, rode my bike, and ran. The water was choppy which I like. The ride was flat and windy, which was fine. The run felt like I had done something really challenging the day before. Like, a mud run or something. As I slogged along for 3 miles on Sunday, I thought about my Friday and Saturday, and realized why my legs felt like two over-cooked Polish kielbasy. On Friday, I rode along side my friend Bill as he ran 34 miles to raise money for LLS. From the ‘burbs to Philly, with a big bag of money to cure leukemia. On Saturday, I spent the day at the ETC packet pick-up. After my shift, I conducted pre-race interviews of the participants of the kids race. I have video and plenty of awesome pictures. That gets it’s own blog post. Who is ready for the kids race??? ME!!!!!!!!!! The great news is that I finished alive and all in one piece. I think my teammates did well. Mini RD and I avoided the sun (and the awards stage) by taking our incredible breakfast plates to the breezy shade under the Focus Wine tent belonging to Joe Caruso. Joey Grapes makes the fabulous Focus wines Parker Pinot Noir and Shea Chardonnay. I needed to keep tasting them to make sure they were still fabulous. What can I say? I’m a good friend. Focus wines are fantanstic, and benefit Children’s Hospital of Philadelphia. BOOM. You stay classy, Cape May. 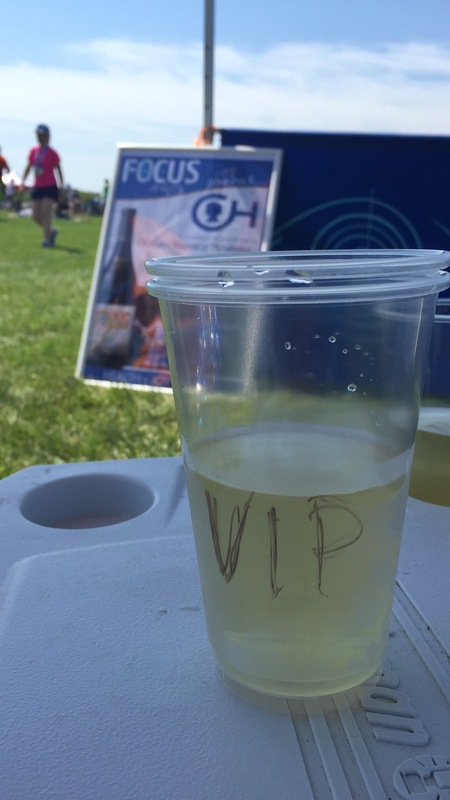 Mini RD and I enjoyed our eggs, bacon, donuts, bagels, fresh fruit, wine and VIP status in the tent. We celebrated our successful escape. But really, who wants to escape from such a lovely setting? It’s nice the race director lets us come back. I like it here too much. Thanks to South Jersey native and U.S. Olympic Triathlete Joe Maloy for providing all participants with free race day photos. Writing this blog is always easier when I have great pictures to go along with the story. Best of luck to Joe in Rio! U.S.A! Love, love this report. Can’t wait for next year.